FCI's MT100 Series Flow Meters when specified with the optional CEMS and CERMS applications package meet the U.S. Environmental Protection Agency's (EPA) 40 CFR Part 60 and 40 CFR Part 75. This package provides a 24-hour interval automated calibration drift test of low and high span points, and interference sensor check. The MT100 meter's optional CEMS applications package includes both an automated and on-demand self-checking of calibration drift (CD) and sensor interference. The results of the CEMS tests are presented as a simple pass or fail message on the LCD readout. The CEMS option also includes two relay outputs for connection to external devices, one to signal test in progress and the other to signal a fail-test mode. FCI's MT100 Series Air/Gas Flow Meters combine state-of-art electronics technology with application-proven precision flow sensors in a rugged package designed for the most demanding plant operating environments. They provide temperature-compensated direct mass flow measurement of air and gases for precise, repeatable measurement with low maintenance requirements in large diameter pipes, stacks and rectangular duct installations. FCI's thermal mass MT100 Series air/gas Flow Meters are available with two to eight flow rate sensing points to overcome these issues. Multiple sensors are inserted at various depths within a pipe or duct and their outputs are multiplexed and averaged to produce the flow rate within the process line. The MT100 meter's sensors can be installed either across a mast or can be inserted at multiple points around the process line in a single plane. In large stack applications, this means that the instrument installation can be done at a single platform location to achieve a major cost savings over other technologies such as ultrasonic meters, which require installing transducers at precise offset angles. The state-of-art transmitter for the MT100 Series Flow Meter is both full-featured and rugged. It comes with an extensive choice of output options to interface with virtually any DCS, PLC, SCADA, or recorder. Dual, isolated, high resolution 4-20mA outputs compliant with Namur NE43, HART (Fieldcomm Group certified), Modbus, 0-1kHz frequency/pulse and a USB port are all included, standard. Optionally available are Foundation Fieldbus and Profibus-PA bus communications. 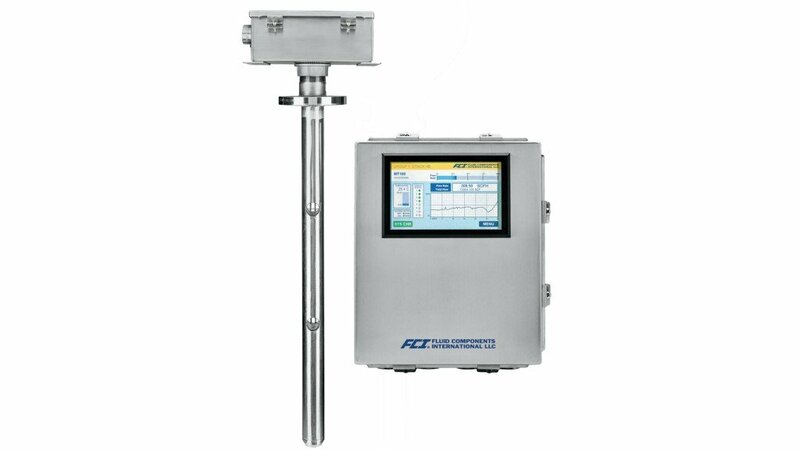 Its best-in-class large color touch-screen LCD readout provides comprehensive process information to users with both analog and digital displays of flow rate, temperature and totalized flow, a user time-base selectable strip-chart of flow rate and sensor status diagnostics. The transmitter's corrosion resistant stainless steel enclosure carries a NEMA 4X/IP64 rating. MT100 Series electronics also include a user programmable data logger feature to which flow rate, temperature and totalized flow as well as fault codes can be recorded on a removable, 8GB microSD card. The instrument also features a calibration drift check, which can be initiated on user demand or programmed to run automatically.